Home / Expert Review - Unique Perspective / Andrew / Uniqueworld Hotels With Ryder Cup Stars – Corporate Golf Schools Providing A Motivation Incentive Travel Reward? Uniqueworld Hotels With Ryder Cup Stars – Corporate Golf Schools Providing A Motivation Incentive Travel Reward? Uniqueworld Hotels & Resorts play golf with Ryder Cup stars past and present, stay at former favourite residence of Jazz great Louis Armstrong and French/American actress Josephine Baker and drink, dine and make shapes at a cool London venue inspired by a late Hollywood screen legend. My travels the last month have taken me to some absolute gems – golfing experiences with Ryder Cup Stars at resorts near Edinburgh, Scotland and near Newcastle, England. Then, with clubs packed away, over to the beautiful city of Prague and two contrasting hotels. Finally, back to a great event venue ( ideal for buyouts) McQueens in uber cool Shoreditch. TPEGS – Tour Pro Experience Golf Schools – is a unique and innovative collaboration between Ryder Cup player and European Tour multiple winning professional Andrew Coltart, and one of Europe’s most experienced and respected golf coaches Gary Nicol. They provide an exclusive insight into how the world’s leading professional golfers learn and prepare for golf tournaments. Working as a hotel consultants for Archerfield Links, it is one of the finest private member’s golf clubs to be found anywhere. The Location could not be better. Easily accessible from Edinburgh and right next door to Muirfield, Archerfield Links sits between Gullane and North Berwick at the very heart of one of the richest stretches of golfing country anywhere in the world, Scotland’s Golf Coast. Close House Hotelis a privately owned, elegant and beautiful 18th century mansion set in stunning Northumberland countryside-situated just 15 minutes from Newcastle. The hotel you has some wonderful touches– from the elegant Champagne Lounge and Bar to the luxurious guests bedrooms, to the gastronomic heart of Close House Argent D’Or Restaurant. The 12 recently opened and very luxurious Courtyard rooms complement the 19 rooms in the main hotel. This new contemporary and state-of-the-art facility will be offering the highest service in a relaxed and unrivalled setting. A stunning contrast to the Mansion and Courtyard is No. 19 is a place where comforting home-cooked food is served in a contemporary environment, where you can enjoy some of our regions. With a great restaurant, outdoor terrace and function room both with panoramic views over the Tyne Valley, they can cater for individuals right up to parties of 140. 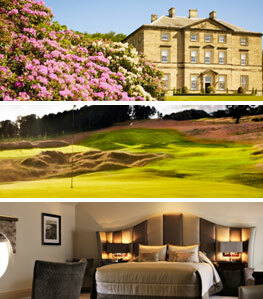 World Top 3 Golfer Lee Westwood is the ‘Attached Tour Professional’ at Close House, Newcastle. And he represents two superb eighteen hole courses, the Colt and The Filly. Both are ideal venues for Corporate Golf Days and layout is designed for variety of levels of golfers. Additionally, there is a full teaching Academy with excellent facilities and recently added fully floodlit bays. This is a great resort experience. Le Palais, classic Belle Epoque style boutique from a classic era. With only 72 Guest rooms and a location not far away from the Old town, this is a real oasis in the city. Ideal for a small, high end retreat or Board of Directors looking for an intimate setting. The accommodation is of a great quality and with excellent indoor and outdoor dining and event options Le Palais is a great option for a smaller meeting in Prague. The Palace Hotel, like Le Palais, is operated by Vienna based VI Hotels, and is situated closer to the centre and all the main attractions near the Old Town. This architectural landmark in Art Nouveau style has been a symbol of hospitality and luxury life style since 1909. A larger property with 114 rooms, the Palace has excellent meeting space with over six meeting rooms and two floors able to be dedicated meeting and event space. The location is ideal for exploring the city and views from many of the rooms, of the Castle and the Opera House are quite stunning. This is a gem of a hotel and a great contrast to the smaller boutique Le Palais – something for all clients. Finally, and back to a faster pace in London, McQueens has been gaining great reputation in the Shoreditch for its Bar/restaurant and club – run by Dezzie McCausland – this is a fantastic venue for corporate party – either taking over a floor or having the whole space. Dezzie has the designed a great venue – great eye for detail and it is a very buzzy place to bring either internal or external clients. Would you like to receive more information about events? Contact us and we will be happy to put you in touch with our members.